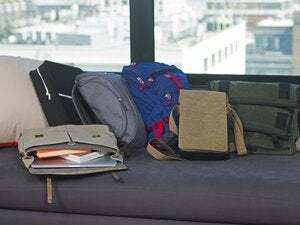 A few weeks ago, I covered several compact laptop bags ideal for carrying a 13-inch laptop and a few vital accessories. Today’s bag, Brenthaven’s $100 Expandable Trek Backpack ( ), is (almost) at the opposite end of the spectrum. Although it won’t hold a 17-inch MacBook Pro—it’s limited to 15-inch models—it will hold more gear than most people will ever need to cary. Available in black/gray, black/orange, or black/blue, the Expandable Trek measures approximately 19 inches high by 15.5 inches wide by either 9 or 11 inches deep (more on this in a bit)—it’s definitely a large pack. The bag is constructed of thick ballistic nylon, and the laptop sleeve, located against your back in the largest part of the bag, has thin padding on the sides and two very thick layers of padding on the bottom. (The bag doesn't use Brenthaven's CORE system.) Overall, like other Brenthaven bags I’ve tested in the past, the Expandable Trek feels exceptionally sturdy and well-made, and it includes a lifetime guarantee. But despite this size and construction, the bag weighs just over 3 pounds empty, which is less than several other large backpacks I’ve tested that offer less protection. The interior of the bag is gray, rather than black, making it easier to find items inside. And you can stuff quite a bit of gear in there: The main compartment—the one with the laptop sleeve—provides nearly six inches (in depth) of additional space; four non-zippered pouches inside this section help organize smaller items. Just in front of the main compartment is a smaller zippered pocket, lined with felt, for storing sunglasses, a wallet, or other small items to which you want quick access. In front of that is the bag’s organizer compartment. While its opening is fairly small, the compartment itself offers a surprising amount of space, as well as several pouches for a phone, an iPod, pens, and the like. A small, rubber-reinforced hole provides a way to connect your headphones to your iPod when the latter is inside the bag. In addition, just below the hole on the outside of the bag is a small, elastic pouch for storing earbuds while keeping them accessible. To the left and right of the organizer compartment are two vertical zippered pockets for carrying accessories or a snack. If that’s not enough space, in between the organizer compartment and the felt-lined pocket is another zipper, this one extending all the way up each side of the bag and across the top. Unzip this to expand the bag by approximately three inches and reveal yet another zippered compartment. Other useful features include two outer zippered pockets, one on each side of the bag, each large enough to hold a portable hard drive. The left-side pocket features elastic sides to let you use the pocket for holding a water bottle. Each of these pockets also has a mesh pouch on the outside. A nice touch, especially for bike commuters, is the outer mesh net for a bike helmet or jacket. When you don’t need this net, it stores in a small, zippered pocket at the bottom of the pack. There are also several reflective strips, as well a horizontal, nylon strap that makes a good mount for a rear bike light. With a bag that can hold this much stuff—3135 cubic inches worth, all told—the biggest concerns are the comfort and stability of the bag when full. The Expandable Trek performed well in these respects during my testing. The main shoulder straps are wide and well-padded, and there’s a height-adjustable chest strap to stabilize the load and take some of the pressure off your shoulders. However, there’s no waist belt, which I missed compared to my personal backpack. 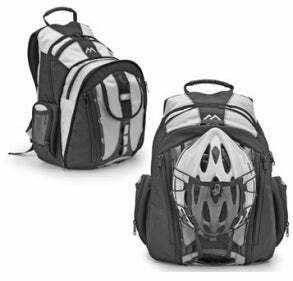 The back of the pack has thick padding with a soft, mesh covering and several recessed sections for ventilation. Each shoulder strap also provides a plastic D-ring and a horizontal nylon loop; either can be used to attach accessories. 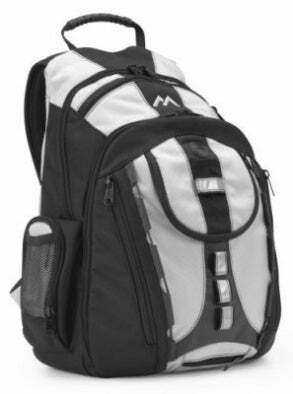 For backpack fans who need lots of room for gear and good protection for their laptops, the Expandable Trek is a well-made and comfortable bag with lots of storage options.